This smaller leaved Osmanthus has distinctive dark foliage and a dense form, making it ideal as a screening plant or as a dark foil plant at the back of the flower border. Attractive trumpets of white scented blossom during the autumn months provided extra impact and a deep pungent scent. Cultivation tips: Osmanthus will grow on most fertile well drained garden soils, including light chalk, in full sun or light shade. 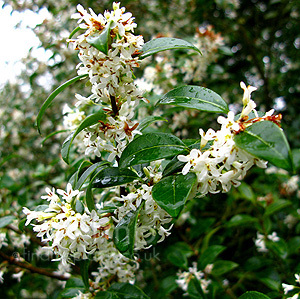 Avoid planting Osmanthus in very exposed, cold or hot dry areas prefering a sheltered spot. Trim to shape as necessary into an attractive dense evergreen shrub. Mulch with compost every few years to feed. Ideal for container growing or as an alternative to holly.